Fullness, in progress. 60" x 36" | 152 cm x 91 cm. Stone, minerals, vitreous, mother of pearl, mosaic gold. In a previous post, I talked about my new iPad w/Apple Pencil and the Procreate app, which my daughter gave me for my birthday. Above you see my initial attempts with Procreate. The Apple Pencil definitely takes some practice. Blending and shading are certainly doable, but I'm far from mastering it. This really is a powerful tool. 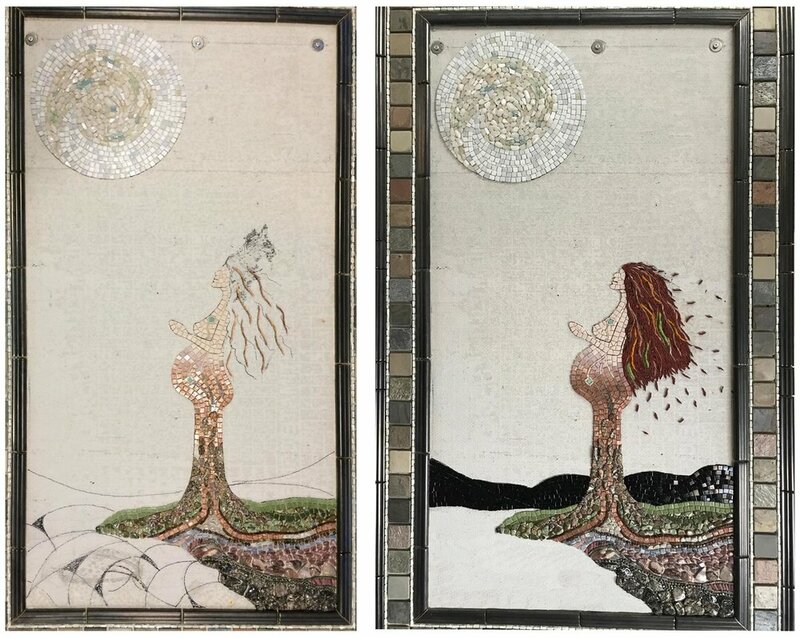 What I did was to import a photo of the mosaic in progress. I also took a photo of the tiles I have chosen and was then able to create a palette. From there, I just started coloring and trying out different pencil tip options and blending tools. There is a marked difference in the sky between the left and the right photo, although both are very rough. The pencil is very sensitive and takes a lot of practice to handle fine detail. But, I think this is so awesome to be able to do this! The photo on left shows my intention for the body of water at the bottom left. I'll be getting started on that moon reflection today. Fullness Circa 1999? 60" x 36" | 152 cm x 91 cm. Photo on left is where I left it back in 1999, minus the gold wavy strips for the hair. On right is where it stands now. I'm not sure about the overall shape of the hair and will most certainly be tweaking it. Well, I'm feeling brave today, or at least brave enough to post pics of my current challenge. Embarrassment notwithstanding, I will share this project as I go. I started this piece over 15 years ago. At the time, I wanted to do something big, so I impulsively rushed into what turned out to be a less than half-baked idea. I wanted to work with some stones but had no idea where to get anything but the small, tumbled, polished ones that you see. 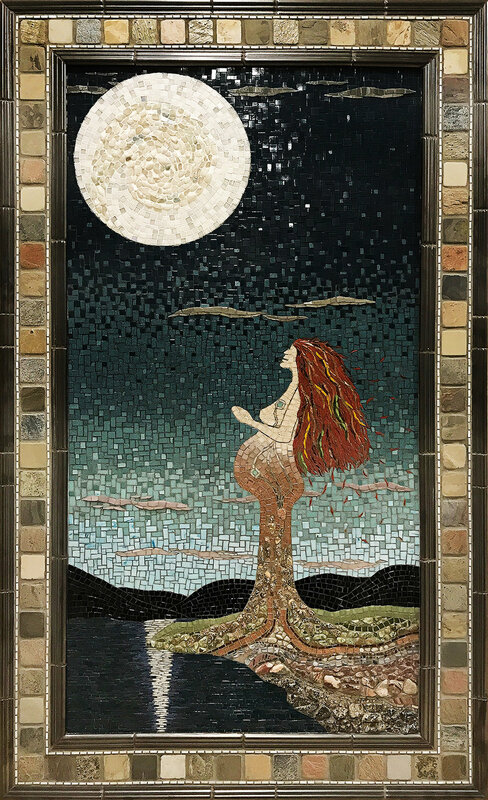 I had the idea for the moon, the full feminine, and the earthy palette, probably inspired by the small slate tiles that I used in the border. Ceramic trim pieces, in a dark gun metal gray—more of a hematite— make up the border outlines, along with small mother of pearl rectangular beads. It did not take long for me to get stuck on it, and then overwhelmed by the fact that I had not figured out several square feet. The hair is where I stopped, lacking the skill and the patience, as well as an idea, of how to handle it. Also overlooked was the fact that the cement board needed both hanging hardware and some kind of support structure on the back, as it had too much flimsy in it for it to be stable. So, it was relegated to various storage locations throughout the years. What to do! It was so big that I could not just throw it away—I would have had to cut it up or have it hauled off. I liked the original idea, however, so continued to hang onto it, hoping that someday I would know what to do with it. Finally, after moving into my new studio, it was time to make a decision. I decided to finish it and, in the process, treat it like an exercise. I've added both a support frame and hanging hardware, and have the hair mostly under control, but will work on it some more—it's too organized. I did those mountains this past week and enjoyed working on some andamento. They are meant to appear silhouetted and far in the distance, on the other side of what will be a body of water in the lower left corner. The photo at right is a bit like what I am going for. I've never attempted a water reflection—neither sun nor moon—so that will be a good exercise. I'm not sure that the new and the old will marry well and be harmonious and whole. The perspective is not realistic; in fact, none of this is realistic. Then, there is all - - - that - - - sky. I want to try something in the sky that will be new for me and also challenge me in what I think will be some very beneficial ways. I've been studying Menossi's Tramonto, on left, for inspiration, with both andamento and the way that he layers the sky. I've got about four shades of vitreous in a kind of gray-blue, and may work in a bit of sheared smalti for scant clouds. Gee! Not sure I can pull it off, but I will give it a go. No, I don't like the apostrophe shape in the moon. It was meant to be a swirl, but I can't say what happened to it. There are other issues as well, too many—too many to change. That's the deal: I won't change what I did in 1999 and I will try to be true to it's beginnings. Fullness (1999-?) 5' x 3' | 152 cm x 91 cm. Vitreous, minerals, mother of pearl, slate, glass. The top, bottom, and right borders are cut off in the photo, as the piece was just too big for me to get it all at this time. Around 18 years ago, when I barely knew what I was doing, mosaically speaking, I decided to make something big! I also wanted to use some stones, and the only ones that I could get my hands on were polished stones from a metaphysical shop in town. 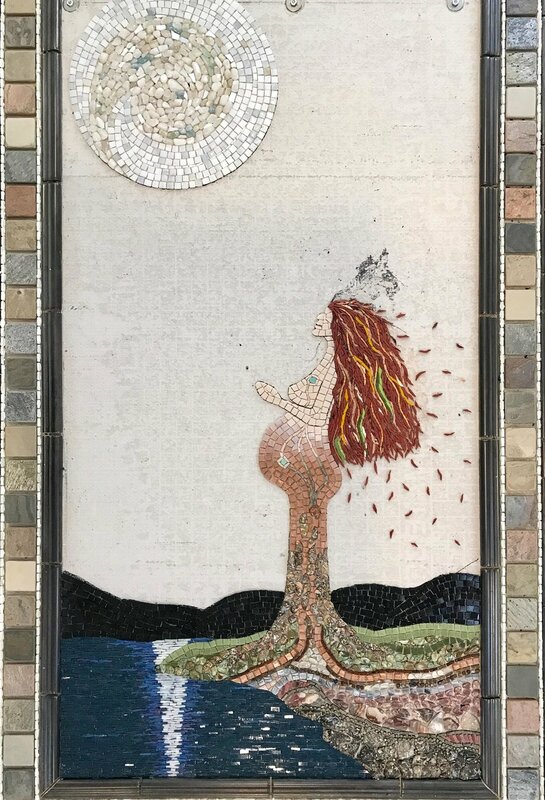 I quite impulsively jumped in on this 5' x 3' piece of Hardi-backer and created a border out of small slate tiles, mother of peal beads, and ceramic decorative strips. Then I started mosaicking my partially thought-through design, leaving a whole lot of unthought-through background. I made it to the hair and lacked both the skill and the confidence to go forward. As for hanging hardware, I would just worry about that later. Well, what do you do with a 5' x 3' abandoned mosaic? I liked the original idea of the piece, and friends and family kept encouraging me to finish it, however I had no appetite for finishing it and did not know what to do with it either. So, I just stored it away and out of sight. Jump to late 2016 and my move into my new studio, which called for serious organizing and decision-making about this albatross. Once I had my new worktables in my studio, I decided that I would keep the mosaic out where I could live with it and make a decision about it once and for all. I realized that I could not move forward on it until I figured out the hanging hardware, as well as a support frame for the back of it. Then, I would need to work out how to finish it. After a few weeks, I started figuring things out, and decided that it would be a great challenge to finish it. And that is what I will be doing for the next few weeks. I've already added support framework to the back and installed the hanging hardware. Also, those copper gold squiggles in the hair area are new and I hope to finish the hair in the next week or so. Then, on to the massive background! I will try to resist the temptation to rework anything that is already done, but it won't be easy. That apostrophe-shaped deal in the moon really makes me a little crazy.